Famous people born on NOVEMBER 14 are known to be nurturing individuals. As a Scorpio, they look out for those in their community, for their family and friends. They know a lot of people in their town who are influenced by them. Generally, famous November 14 celebrities give people gifts that they don’t mind showing off to others. They remember birthdays and anniversaries which makes them one considerate individual. They can be sure that they work within their sixth senses when it comes to making decisions that effect them and those around them. Famous people born on November 14 are curious individuals who have the ability to make a lot of money. They need to be careful not to let it go to their head. As a career option, they should look into becoming a legal expert. With their need for adventure this could be rewarding and emotionally beneficial. Besides that, it gives them the freedom of not being tied to a desk. 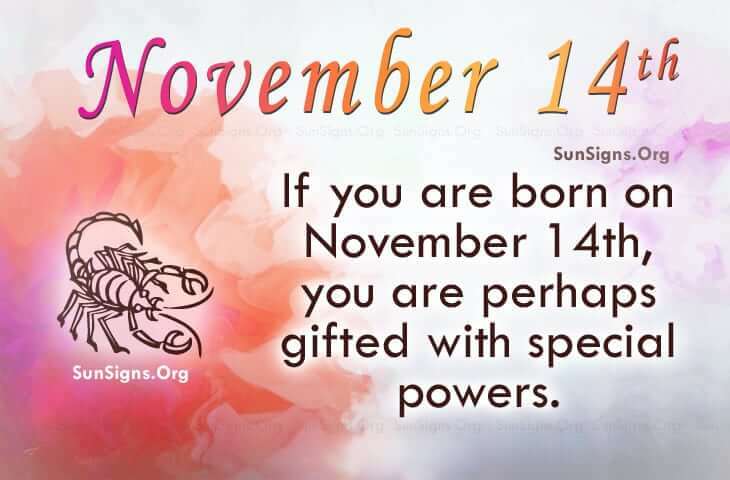 Famous people born on NOVEMBER 14th are perhaps gifted with special powers. They are sensitive and receptive as well. When it comes to handling their business, they are on top of their game. Mainly, they rely on their gut to help make solid decisions.